These are readymade, no-effort chapattis that you just need to heat and eat. 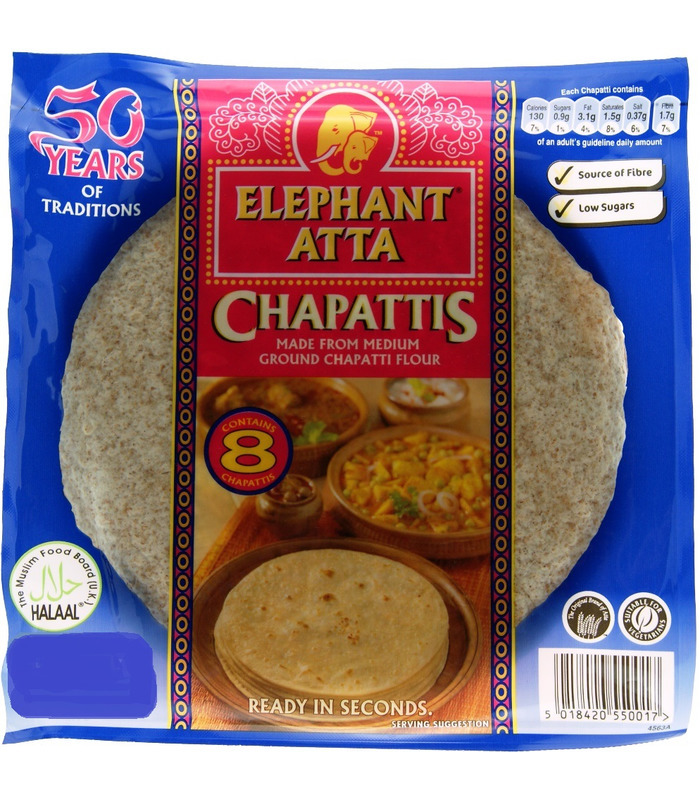 The Elephant Atta Chapattis can be used as a wrap or roti and served with curries. The ideal quick and easy option for large dinners and parties! 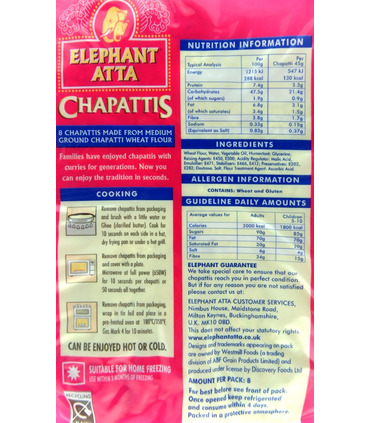 The pack contains 8 chapattis made from medium flour. Storage Store the unopened pack at room temperature in a cool, dry place, away from direct sunlight. 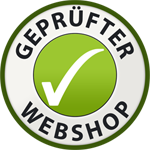 After opening, store the pack in the refrigerator and consume within 2-3 days. Preparation Heat up a pan and toast the chapattis one by one. You can add a dollop of butter or ghee to the hot roti to give it richness and flavour. 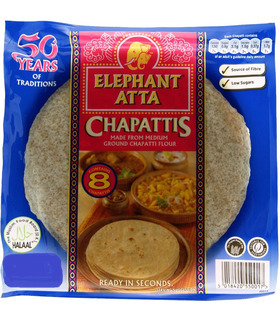 Read more about chapattis here . These are readymade, no-effort chapattis that you just need to heat and eat. The Elephant Atta Chapattis can be used as a wrap or roti and served with curries. The ideal quick and easy option for large dinners and parties! The pack contains 8 chapattis made from medium flour. Heat up a pan and toast the chapattis one by one. You can add a dollop of butter or ghee to the hot roti to give it richness and flavour. 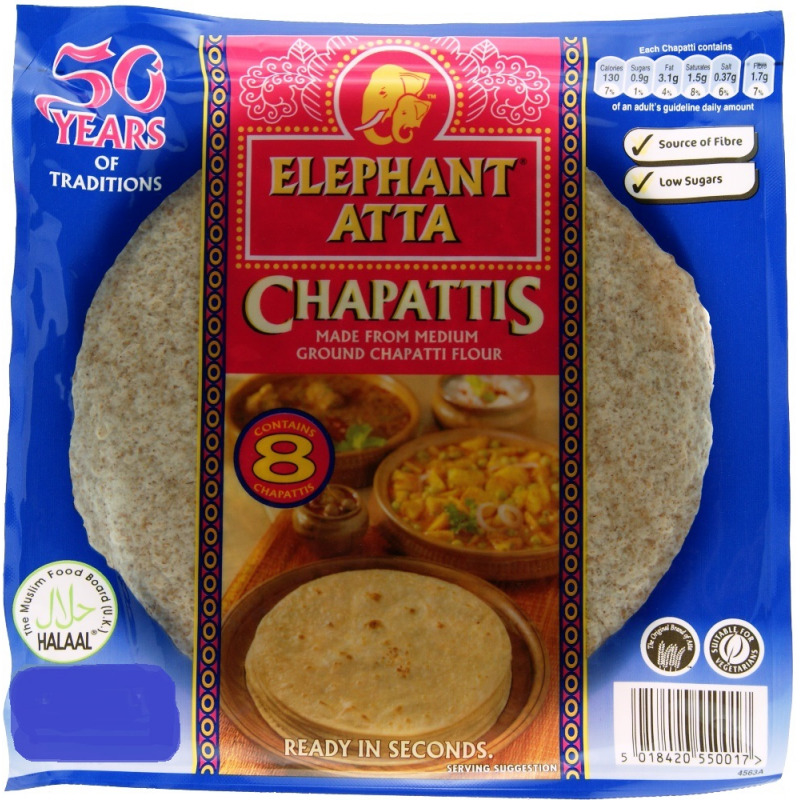 Read more about chapattis here. Wheat Flour, (Vitamin B1, Niocin, Calcium, Iron), Water, Palm Oil, Humectant: Glycerine, Raising Agents: E450, E500, Acidity Regulator: Malic Acid, Emulsifier: E471, Stabilsers: E466, E412, Preservatives: E202, E282, Dextrose, Salt.